Immerse yourself in a vast and magical world filled with fearsome monsters, lethal bosses, and unpredictable environments that challenge you to adjust your combat tactics on the fly. Command five Champions, each infused with elemental powers of Fire, Water, Nature, Lightning, or Metal. But victory will require more than brute force; it will demand clever strategies, fast tactics, and an ability to deliver punishments strong enough to make a grown monster cry. Not all Real Time Strategy games have to be murky, Sci-Fi affairs. 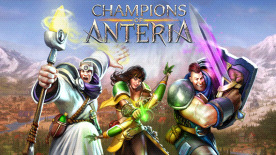 Champions of Anteria is Bright, colourful and offers you a whole land to conquer. From Land to Sea, to Desert and Forest, Champions of Anteria has it all, whatever the weather. Don’t expect this game to be an easy ride, you’ll have to use all of your tactical skills to conquer these lands. Pick the right Champions out of the five available, and the right combination and tactics will see you live to fight another day. It’s not all about the conflict, though. There’s also a pretty sweet fully-featured narrative in there, too! Discover the story of your heroes, and take down a bloodthirsty corrupted wizard and his dark army of evil undead. This is going to be a game where you’re gonna need to pop your thinking caps on to find the best strategy to guide you to victory!